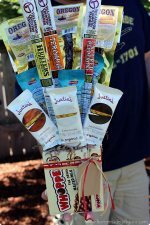 Best Cheap Homemade Gift Ideas that Don't Make Cheap Gifts? It's the Thought That Counts But Why Not Make the Gift Awesome Too! Whether you're a struggling student, a grandparent with loads of grandchildren, anyone blessed with too many friends to buy gifts for, or even a mommy or daddy in need of a little something extra for the kids, you're very much not alone. 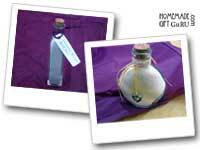 Beyond all that... sometimes it's just fun to make inexpensive homemade gifts, like these lavender bottles that can be whipped up in the summer for scenting rooms and linen drawers. The lack of a price tag (some gifts cost literally pennies to make) gives way to freedom to create and give just for the fun of it! The homemade gift ideas below are all on the thrifty side! If you love saving money, you may also love my huge selection of free printables. In most cases, all you need is a printer and some paper to use these free resources. Save $ with my FREE printables! Ready-to-go free printable gift tags: Just print and cut these fully designed gift tags! 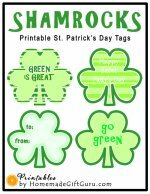 Printable Craft Templates including a ton of gift tag templates that you can use to make your own gift tags and even stencils. Printable Gift Tags made SPECIAL for homemade gifts. These tags say things like "Made by _____" "Made with Love" and "Made with Love and Warm Wishes"
And that brings me to my first cheap homemade gift idea that makes an AWESOME homemade gift... it starts with a free printable! 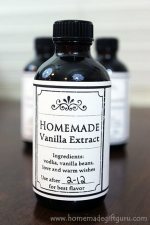 A personal favorite and a wonderfully cheap homemade gift idea... Anyone can do this! 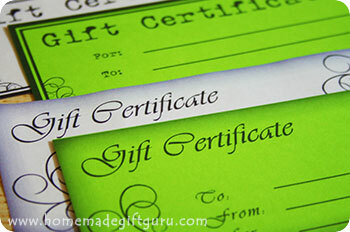 If you want to give something really special from your heart and something free at that, homemade gift certificate coupons are a great free homemade gift idea! They also make great last minute gift ideas. Got Salt? 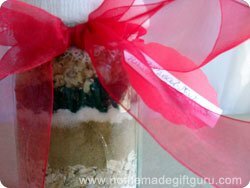 Make up a batch of luxurious homemade bath salts or other homemade bath and body goodies for a cute and cheap homemade gift idea for your mother, daughter, friend or lover. You can make your own canisters easily and for free using my simple method! 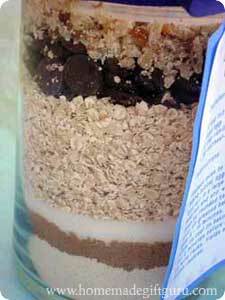 Then fill them up with whatever goodies you want, whether baked, store-bought or handmade. Homemade canisters, using my easy method that utilizes used gift bags, are extremely easy to make and they fit so well here on my cheap homemade gift ideas page with a financial cost of $0.00. You'll have a blast deciding what to put inside no matter how thrifty your holiday budget is! Some ideas include: homemade caramel popcorn, dollar store goodies, assorted candy bars and homemade cookies. 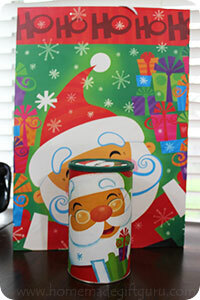 Design your canisters to match any holiday or occasion by choosing the perfect gift bag! Rose petals, lavender, rosemary! 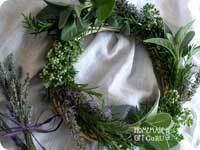 Make a herb wreath as seen to the right! Put together wild flower bouquets... they are surprisingly beautiful! Craft with dried pansies and other dried pressed flowers! 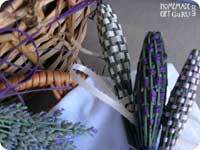 Use fresh lavender to make simple lavender bottles, a flower craft that cost mere pennies. Another nearly free cheap homemade gift idea... Find or buy some little clay pots and take advantage of plants that can be separated and shared! 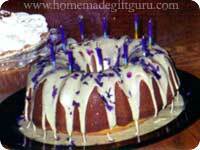 Speaking of utilizing your garden goods... You can also use your garden herbs and edible flowers to make gourmet party foods such as birthday cakes and a wide variety of pastries... a favorite of mine are my Aunt's lemon birthday cakes with purple pansies. She uses the pansies (an edible flower) to decorate her cakes inside and out! Make a mix, bake something from scratch, put together a few spreads, dips or a even a special drink. There are many delicious and cheap homemade gift ideas to make in the kitchen... for example, if you get a candy thermometer (a very small investment), you can even make easy homemade candy, such as truffles, fudge or perfect caramel popcorn. Tips: Pair up two or more food gifts for a fancier present. Put them in a cute container (you can even make origami boxes) for even more visual appeal. Cheap homemade gift ideas from the kitchen don't have to be edible, they can simply be for play. ...as well as a special Kool-Aid play dough recipe mix in a bag that's very cute and frugal to give (shown right). 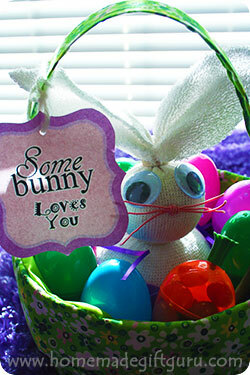 Another fun craft kit using stuff from the kitchen is this sock bunny craft kit. It uses rice, baby food jars and baby socks (you may have some little bitty socks packed away or you can get some at thrift or dollar stores). You can make a sock bunny craft kit for Easter but they could also be fun for other holidays, because bunnies are just that cute. 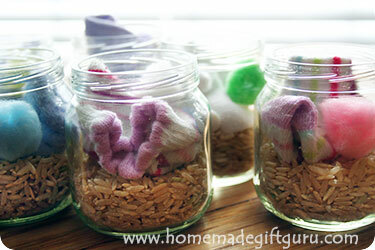 You could also make a sock craft kit using other no-sew sock craft ideas. A frugal tip? Hold on to attractive images you might otherwise throw away (for example decorative party napkins leftover from special occasions can be used in a decoupage project... here's a napkin decoupage box for an idea). Rather than buying decoupage paper, use wrapping paper, left over party napkins, old calendars, post cards etc. 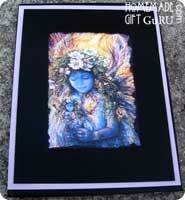 for frugal collage gifts and decoupage projects. Learn super easy ways to make a journal or a book. Plus, choose a theme that will customize the book for the perfect inexpensive homemade gift. What can paper make? All sorts of great homemade gifts! Think photo albums, mini scrapbooks and framed pieces. Try making paper beads, address books, or again... homemade journals (shown above). A cheap and last minute idea is to make your own gift box with a favorite patterned paper using these easy origami box instructions. 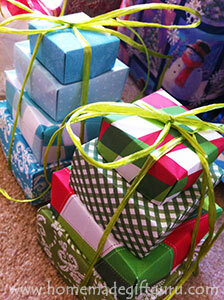 Then enclose your store bought or homemade gift or treats. You can even stack 4 different sized origami boxes together to make a cute and trendy origami gift box tower (as shown to the right). You can also use paper to make your own cards, like this pouch card made to hold a small but meaningful gift that can be made and mailed for cheap. Many craft stores have amazing sales and coupons available but never at the last minute when you need them - I know this from lot's of experience! So whenever possible - stock up, get 'em while they're hot and feel free to use this holiday calendar list or read about free reminders for help you get ahead of birthdays and holidays. Quick Tip: If you find yourself putting something together at the last minute, don't hesitate to use my printable tags and gift tag templates to address your homemade gifts and more. Shop After-Holiday Sales. Many items are available seasonally. Right after a holiday is the best time to get discounted stuff for next year. Re-use and Re-purpose. Use stuff you have. Save pretty bottles, shop dollar store deals (if you have one) and pick up tins and wooden objects (stuff you can paint or decoupage) from thrift stores for re-purposing. Sew, Knit or Crochet. Fabric, yarn and thread can be used to make an endless array of creative and inexpensive homemade gifts. Homemade blankets and quilts, for example, are timeless and still widely popular homemade gifts, but there are also many other things you can do with fabric, yarn and/or thread. For example, you can make totes, rugs and more with old but shapely sweaters and clothing - definitely a budget winner. If you're knew to knitting you can get a knitting loom and make a super cute hat or scarf in a single evening! Don't forget to search your house for hidden treasure! Keep your eyes out for these types of "treasures" and save them all year long. Saving stuff like this will make or break your day when creating homemade gifts and they will most definitely reduce the cost of any project. Decoupage. Decoupage is fabulously cheap to do with endless possibilities. You can decoupage almost anything, using images from almost anywhere. 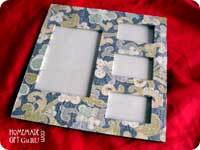 Decoupage is a skill that anyone can acquire, it takes very little practice (you should be able to create something great even with your first try) and has a very low "start-up" cost as well. Craft Embellishing. There are many other ways to embellish an item you find for cheap. Use a hot glue gun, cover it with fabric, use beads, ribbon, buttons, sewing and more. 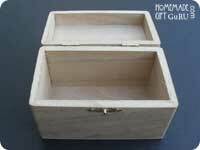 The key is to find a great "base" for your homemade gift, such as a cheap, unfinished wooden box. Then turn it into a something special, beautiful or meaningful. Many great cheap homemade gift ideas come from such embellishing. Origami is AWESOME! There's something magical about turning a few pieces of paper into a beautiful gift tower!